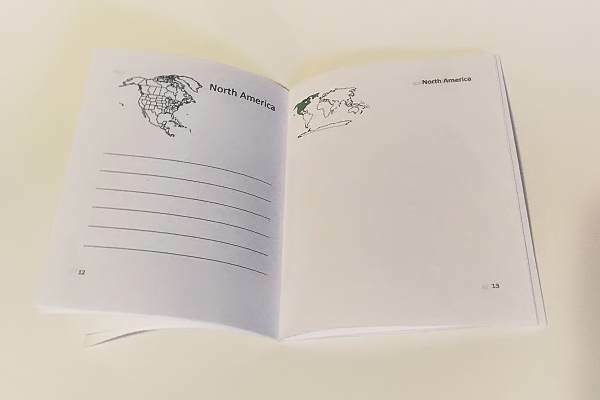 Animals of the World is a printable quarter-size booklet that features a small map of each continent. 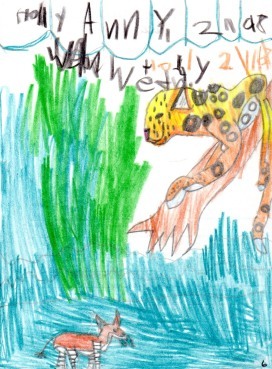 Each continent has four pages on which the student will list a few wild animals, and at some point, draw at least three of the animals that live in the continent. I made the first Animals of the World booklet for my daughter when she was 8 years old. She was interested in the wild animals and enjoyed drawing them. Art - My daughter drew the animals in life situations such as resting with their young, stalking or being stalked, and sitting or playing in their natural habitat. The booklet is designed to be printed on both sides of 4 pieces of 28 to 32lb paper. The printed booklet is then to be cut in half and the pages stacked so that the page numbers line up. Read more details below. Because this is a Quarter-Sized Booklet, the file must be printed in a certain way, so please read the printing instructions. The booklet requires 4 sheets of printer paper. I recommend that you use 28 to 32 lb. paper to reduce or eliminate ink-bleed-through. The booklet has to be printed in a certain way on both sides of the paper so that the pages will be in order when the printed papers are cut in half and assembled. Three Printing Options- Below I will describe three ways to print the Animals of the World Booklet. If your printer supports double-sided printing, I recommend using that setting; it is described in option 1. If your printer does not support double-sided print, then print the booklet using option 2 or 3. Do not choose a "booklet" setting when printing this file. Duplex, Double-Sided: If your printer is capable of double-sided printing, then this is the quickest way. Load four sheets of 28 to 32 lb. paper in your printer, select double-sided (duplex, "print both sides of paper") and let the printer do its thing. I have test printed the booklet with this method. 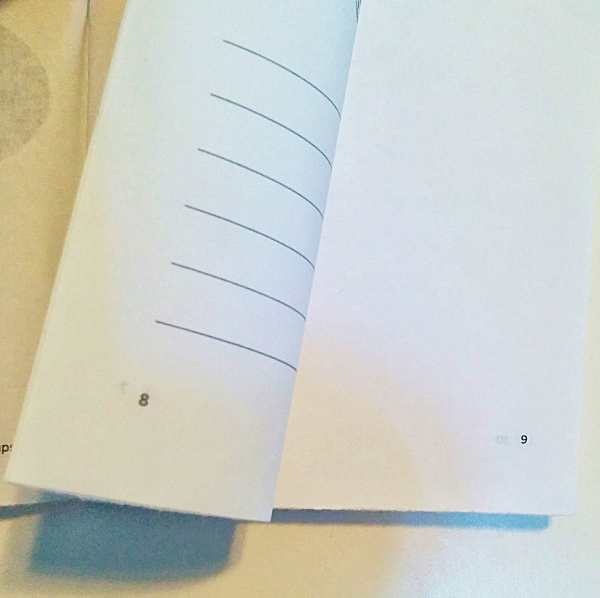 Note, you'll know that it is probably working if the first page prints on both sides -- all four pages will print on both sides, but if the first page is not printed on both sides, stop the print job because it's either not set up correctly or the printer can't print double-sided. 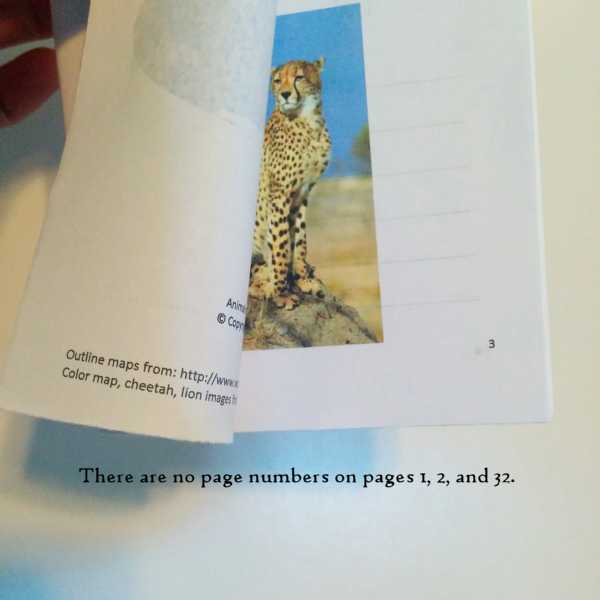 First Odd Pages, then Even Pages: So, the next easiest way to print the booklet is to first print the odd numbered pages, then correctly reload the paper and print the even numbered pages. I (also) test printed the booklet with this method. Print page 1, reload paper and print page 2 on the other side. Print page 3, reload paper and print page 4 on the other side. Print page 5, reload paper and print page 6 on the other side. Print page 7, reload paper and print page 8 on the other side. So basically, the 8 pages of this file should be printed back to back in perfect order on 4 pieces of nice paper. Okay then. After printing the pages, cut each one in half and stack the pages in order. When stacking the pages, pay attention to the page numbers. I find it easy to line up the page numbers on the left side of the booklet while not paying attention to the other side. Fold the booklet in half so that it is in its "booklet" shape. Page through the booklet and make certain that the pages are in order. If everything is good, staple along the fold. The continents are in this order: Africa starts on page 4; Asia starts on page 8; North America starts on page 12; South America starts on page 16; Antarctica starts on page 20; Europe starts on page 24; Oceania starts on 28. The List Pages are the lined pages in the booklet. Additionally, the list page contains a small map of the featured continent. Three drawing pages follow the list page. The first drawing page contains a small map of the world with the featured continent highlighted. This is to show where the continent is located in the world. While the Animals of the World booklet is about animals, it leans toward geography. As your child learns about wild animals, look up where they live and have the child write some of the names of the wild animals on the appropriate "list page" in the booklet. At some point during all of this, your child could learn more about how the wild animals live or coexist and then draw at least three pictures about the animal(s) on the three blank pages for each continent. Animals of the World is a 1/4-size booklet. Printable lessons that I made for my children and you may print them from my website. 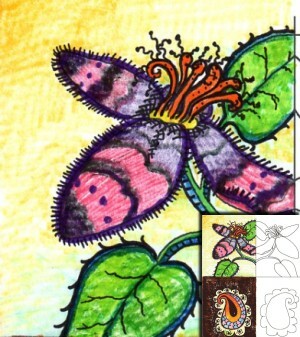 Purpose of lessons: To learn to see as an artist sees and apply that skill to drawing. To be more specific, to recognize the size, shape, position/direction of lines, dots, circles, etc. in a defined space. Drawing with Children Lessons One and two are about drawing. Lesson Two Lesson Plan suggestions.